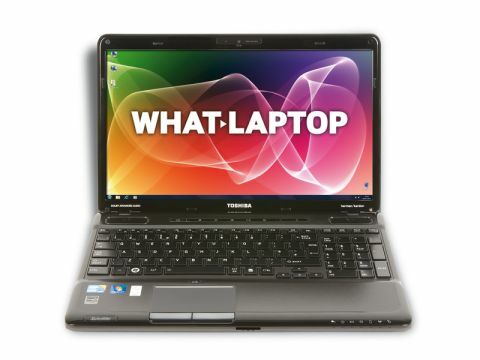 Toshiba's Satellite series comprises its consumer laptops and offers a range of high-quality laptops at varying price points. The Satellite A660-18N is a powerful home media centre, designed to combine basic entertainment features with mid-level mobility. At just 2.6kg, this is a laptop you can comfortably carry around the home. Despite its large 16-inch screen, the chassis' surprisingly slim dimensions let it slip easily into a carry case. Unfortunately, the 129-minute battery life is truly awful, so you won't be able to travel very far. Resilient textured plastics have been used throughout this machine, making it more than tough enough for the whole family to use. The matt finish keeps scratches and smudges to a minimum, adding another layer of protection. The 16-inch Super-TFT screen has a 1366 x 768 pixel resolution and is ideal for home entertainment. Its widescreen aspect ratio allows movies to be shown in their native format and also allows two or more windows to be viewed side by side. Image quality is also excellent, with the panel proving bright and vibrant. The keyboard employs the same isolation-style design as the Advent Sienna 700 and Sony VAIO VPC-Z12V9E/X and is comfortable and responsive to type on. A numeric keypad is in place on the board's right side, making it easy to quickly input data while typing. On paper the Toshiba should be a powerful laptop, thanks to its use of a quad-core Intel Core i7 740QM processor, but in testing we found the Sony to provide greater performance. That said, this is certainly not a low-powered machine. With a base clock-speed of 1.73GHz, the quad-core CPU ramps up to an impressive 2.93GHz when required. Outperforming all but the Sony VAIO VPC-Z12V9E/X, software opens and runs far faster than any Intel Core i3 and i5-based machines, making it a great choice for frequent and demanding use. Graphics are not quite as powerful, but will be suitable for most home use. The Nvidia GeForce 310M graphics card will run many games with adequate speed, but the HP Pavilion dv8-1250ea and Sony VAIO VPC-Z12V9E/X are significantly faster, so bear this in mind. Adding to this laptop's consumer appeal is its excellent software package. Tools for home office use, internet security and CD/DVD creation are all included, among others, so you can get straight to work without having to add to your budget. While the Satellite A660-18N is narrowly bettered in terms of features and performance by the HP and Sony, it is still an excellent consumer laptop with a huge amount to offer. If you're after a high-powered machine at a good price, there's a lot to like.